Hi. Sorry for the lack of updates. I caught a cold with the rest of family. Couldn't be bothered with sanding and associated dust.. But alas all better know so back into it. Was filleting frames, stringers etc. Not many pictures but labour intensive. Slowly getting the knack for a good job. Filleting is generally easy. I have been making thickened West System and micro balloons in a zip-loc bag and applying. Then using a rounded mixing stick to radius. It is just hard to make the corners look right. Often it looks like a botch job. They are hard to sand to get a nice looking finish. I can see why guys take a week or two to get right. I'm fast getting to the stage the as long as they look reasonable lets just finish them up and get some paint on. I went to the Auckland Maritime Museum and looked at the New Peter Blake exhibit. There is a bunch of classic racing plywood dinghys. I sussed out their fillets. Some are good and some very average. Does it matter? I'm tending to think let's get the boat completed and in the water. 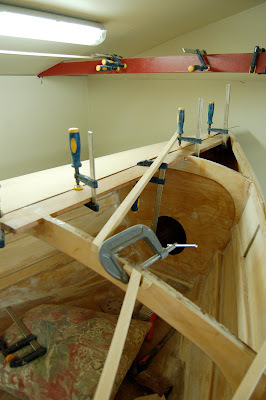 So at this stage I am doing a combination of sanding fillets and getting on with next step of deck construction. I want the boat upside down within a week or so to paint. When it is upright we will tidy up the odd fillet and paint interior. Deck stringers mocked up. Will glue up tomorrow. Deck on the day after.